The narrow lanes in the Old Town of Nice in the Provence, France has all sorts of unique shops selling handcrafted goods. 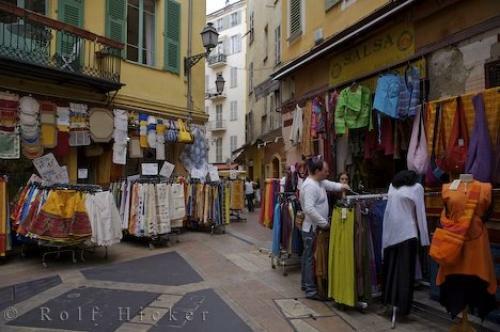 Photo of the shops in the narrow lanes of Old Town, Nice in the Provence, France in Europe. ... No trip to the Old Town of Nice is complete without purchasing a few things from the shops.Shops along the narrow lanes of Old Town, Nice, Provence, Cote d'Azur, France, Europe. I photographed this photo with the digital SLR camera model Canon EOS-1Ds Mark II, aperture of f/5.0, exposure time of 1/100 sec. on ISO 100, as always I used a original Canon Lens, the focus lenght for this picture was 24mm.